I had someone ask me last week where I got the name “Treacle and Ink”. If you haven’t been reading this blog from the very beginning, you may have missed this post where I answered that very question. Since I’ve already addressed the question, I won’t dive into the answer in today’s post (check out “Treacle = Molasses” for more info), but instead, I would like to take this treacle education a little further. “a. molasses, esp. that which is drained from the vats used in sugar refining. Now, I have known that since I was young, and therefore been able to ask the occasional “What is treacle?” inquiry. But, up until a few weeks ago, I had never actually messed with the stuff. In fact, my first treacle taste was as a part of that treacle fudge I sampled over this past year’s summer vacation. So, after I posted my Last Minute Halloween Party Round-Up, I did just what I said I would, and set out to make some Treacle Tarts. This experiment began with a trip to British Emporium. Fortunately, I live in an area in which you can find specialty stores for countries all over the world. Not only did they have a stack of lovely cans of Lyle’s Black Treacle, but they also had a stash of Kinder Bueno bars, which I love. Now, if you don’t have a British specialty store in your area, you might just be able to find some treacle in your local grocery store. I’ve seen some in a few on the international foods aisle. I trucked my treacle home and popped off the lid. What was inside was about the consistency of tar, very thick and very sticky blackness. It was so thick that it was difficult to spoon through and even more difficult to get into the pan without leaving sticky trails across the counter. The recipe called for heating the treacle, which worked like magic on causing it to thin out and become more manageable. Once I got the tarts mixed and baked, it was time for the taste test. They were very sweet, and quite bitter at the same time. The tart had about the same consistency as a brownie right out of the oven, but as they cooled they began to get more and more dense. I liked the flavor, but they were almost too bitter for me. Bottom line: I liked the flavor, but I think if I make them again, I’ll use Lyle’s Golden Syrup instead. 2 Responses to "My Education In Treacle"
Interesting that you used proper black treacle for Treacle Tarts. I come from the UK and all the Treacle Tarts I ever made or ate over there used golden syrup instead of treacle. You see over there, in some areas people call syrup “treacle” and treacle “black treacle” in order to dsitinguish them. I highly recommend trying again with Lyle’s golden syrup. . .they will be delicious! Thanks for giving me a new wrinkle in my brain, Kate! I did not realize that “treacle” could refer to either type. Now I’m thinking that golden syrup is probably what the recipe meant all along. 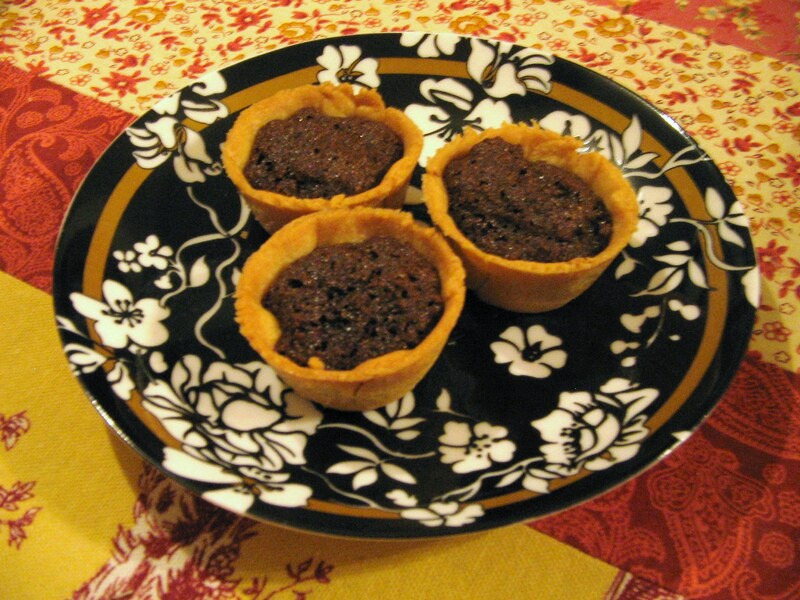 I will certainly have to give these little tarts another try.